Given that the great city of Buffalo, New York has raised its hangmen all the way to the White House, it might come as a surprise that the Queen City has hosted only a single public hanging day. 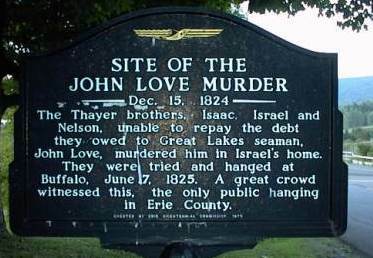 This is the anniversary of that day, which saw droogish brothers Isaac, Israel, and Nelson Thayer turned off from the same gallows for the murder of John Love — the Thayers’ former boarder, turned considerable creditor, turned potential forecloser. The very enjoyable blog Murder by Gaslight, whose beat is America’s 19th century crime scene, has the story of the Thayer brothers fully narrated — along with a separate post featuring a very ungainly murder ballad. Well, we can’t all be Oscar Wilde. On this date in 1882, George Henry Lamson was hanged at England’s Wandsworth Prison for poisoning his brother-in-law in pursuit of an inheritance. Once decorated for his volunteer medical practicioning in the benighted lands of eastern Europe, Dr. Lamson fell prey upon his return to England to morphine addiction which cleaned out his assets. Desperate to resolve his debts, he administered a lethal aconitine dose to the paraplegic 18-year-old Percy John. Apparently, the good doctor had learned all about this efficacious chemical at the knee of Queen Victoria’s own physician, Robert Christison. Unfortunately, Lamson hadn’t been keeping up with his technical journals in the meantime: Christison had taught him that aconitine poisoning was undetectable, but a forensic technique to identify it had subsequently been developed. The particulars of Lamson’s trial are recounted at length in this free book, from which we excerpt the interesting description of executioner William Marwood’s craft in arranging the scene. When the convict was pinioned the procession moved on, the clergyman the meanwhile reading the service of the Church appointed for the burial of the dead, the doomed man respondnig almost inaudibly to the words as they were uttered by the chaplain. It was with great difficulty now that he could walk at all; indeed, it is certain that had he not been supported by the two warders who stood on either side of him, he would have fallen to the earth. Suddenly he came in sight of the gallows, a black structure, about 30 yards distant. The grave, newly dug, was close at hand. The new and terrible spectacle here acted once more with painful effect upon the condemned man, for again he almost halted and fell. But the warders, never leaving hold of him, moved on, while Marwood came behind. At last the gallows was reached, and here the clergyman bade farewell to the prisoner, while Marwood began his preparations with the rope and the beam overhead. With a view to meet any accretion of fear which might now befall the culprit, a wise provision had been made. The drop was so arranged as to part in the middle, after the fashion of two folding doors ; but, lest the doomed man might not be able to stand upon the scaffold without assistance, two planks of deal had been placed over the drop, one on either side of the rope, so that up to the latest moment the two warders supporting the convict might stand securely and hold him up, without danger to themselves or inconvenience to the machinery of the gallows. In this way Lamson was now kept erect while Marwood fastened his legs and put the cap over his eyes. He must have fallen had the arrangement been otherwise, for his effort to appear composed had by this time failed. Indeed, from what now occurred it is evident that the convict yet hoped for a few moments more of life, for, as Marwood proceeded to pull the cap down over his face he pitifully begged that one more prayer might be recited by the chaplain. Willing as the executioner possibly might have been to listen to this request, he had, of course, no power to alter the progress of the service, and was obliged to disregard this last demand of the dying man. Signalling to the warders to withdraw their arms, he drew the lever, which released the bolt under the drop, and so launched the prisoner into eternity, [the] clergyman finished the Lord’s Prayer, in the midst of which he found himself when the lever had been pulled, and then, pronouncing the benediction, moved slowly back to the prison. Though aconitine poisoning dates back to antiquity (the Greeks figured that the original dog from hell, Cerberus, drooled aconitine) and has been used as a literary device by Oscar Wilde, James Joyce, and J.K. Rowling, Dr. Lamson’s was long the last known case of criminal homicide by aconitine — until the 2009 conviction of a west London woman for slipping this illustrious mickey to her paramour in his chicken curry. On this date in 1896, Royal Horse Guard trooper Charles Thomas Wooldridge was hanged by the neck until dead at Reading Gaol, for the crime of murdering his wife. Celebrated playwright and wit Oscar Wilde had been clapped in that same prison the previous November after his sensational conviction for “gross indecency” — that is, homosexuality. Sometime Trooper of the Royal Horse Guards. Having no words to improve on Wilde’s, we offer his “Ballad” in its entirety for the savoring (the audio file is a reading of the text). Find it on Gutenberg or Google Books. So wistfully at the day. With sails of silver by. My pain I could not feel. And so he had to die. The prison of its prey. With the yellow face of Doom. That the throat may thirst no more. And drank the morning air. As though it had been wine! The man who had to swing. Had such a debt to pay. Before it bears its fruit! His last look at the sky? To dance upon the air! His sightless soul may stray. In God’s sweet world again. But in the shameful day. For fear the man might die. Their scaffold of its prey. And left a little tract. The hangman’s hands were near. And make his face a mask. Pent up in Murderers’ Hole? Could help a brother’s soul? We trod the Fool’s Parade! And clattered with the pails. We passed an open grave. Some prisoner had to swing. White faces seemed to peer. With a hangman close at hand? For the blood we had not spilt. Mad mourners of a corpse! Was the savior of Remorse. Before us seemed to play. The phantoms kept their tryst. Like the wind upon the sand! For they sang to wake the dead. But fettered limbs go lame! Each helped us at our prayers. Of the Justice of the Sun. To have such a seneschal? God’s dreadful dawn was red. Had entered in to kill. Nor ride a moon-white steed. To do the secret deed. And what was dead was Hope. For the best man and the worst. Like a madman on a drum! From a leper in his lair. Which none should look upon. Each from his separate Hell. Whilst they had killed the dead. And makes it bleed in vain! And no man spoke a word. By the quicklime on their boots. That the man should have his pall. Wrapt in a sheet of flame! But it eats the heart alway. Each simple seed they sow. The white rose whiter blow. Out of his mouth a red, red rose! Out of his heart a white! Bloomed in the great Pope’s sight? That God’s Son died for all. Has neither Sun nor Moon. And hid him in a hole. In which their convict lies. Whom Christ came down to save. A year whose days are long. With a most evil fan. How men their brothers maim. And none a word may say. Wild-eyed and cries to Time. Becomes one’s heart by night. Than the sound of a brazen bell. With soul and body marred. And break the heart of stone. With the scent of costliest nard. And peace of pardon win! And cleanse his soul from Sin? May Lord Christ enter in? And he of the swollen purple throat. The Lord will not despise. The hand that held the knife. And his grave has got no name. “Each man kills the thing he loves” … words that must have originated in a fathomless depth in the soul of our renowned poet, who signed the poem only with his cell number and died penniless in 1900. Part of the Themed Set: The Ballad. 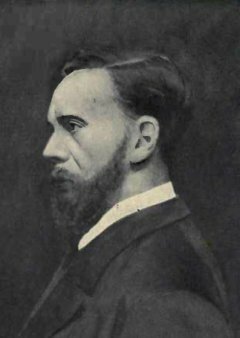 On this date in 1903, Irish MP Arthur Alfred Lynch waited 26 minutes for a jury to convict him, then heard the sentence of a British court for having fought against the British Empire in the Boer War. Yes, even if the black cap gave away the ending, the judge was going to take his time getting to it. Even allowing that this sentence was pronounced before either of the coming century’s world wars, calling the Boer War to conquer South Africa for the crown England’s “darkest hour” only underscores how very long Britannia had stayed in the sun. Were the early shadows of empire’s twilight visible from here … or was it just standard issue judicial showboating? [Y]ou thought it safe, no doubt, to lift the parricidal hand against your country. You thought she would shrink from the costly struggle wearied out by her gigantic efforts, and that, at the worst, a general peace would be made which would comprehend a general amnesty and cover up such acts as yours and save you from personal peril. You misjudged your country and failed to appreciate that though slow to enter into a quarrel, however slow to take up arms, it has yet been her wont that in the quarrel she shall bear herself so that the opposer may beware of her, and that she is seldom so dangerous to her enemies as when the hour of national calamity has raised the dormant energies of her people — knit together every nerve and fibre of the body politic and has made her sons determined to do all, to bear all, to sacrifice all on behalf of the country that gave them birth. The only — I will not say excuse, but palliation that I can find for conduct like yours is that it has been for some years past the fashion to treat lightly matters of this kind, so that men have been perhaps encouraged to play with sedition and to toy with treason, wrapt in a certain proud consciousness of strength begotten of the deep-seated and well-founded conviction that the loyalty of her people is supreme, and true authority in this country has slumbered or has treated with contemptuous indifference speeches and acts of sedition. There’s some relish here, the kind you’d hear if Antonin Scalia had an opportunity to pass sentence on Cynthia McKinney. 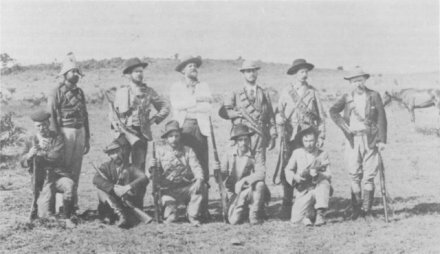 Col. Lynch’s Irish Brigade, from this South African military history page. But had you and those with whom you associated yourself succeeded, what fatal mischief might have been done to … that inheritance of power which it must be our work to use nobly and for good things; an inheritance of influence which will be of little effect even for good unless backed by power, and of duty which cannot be effectually performed if our power be shattered and our influence impaired. He who has attempted to do his country such irreparable wrong must be prepared to submit to the sentence which it is now my duty to pronounce upon you … that you be taken hence to the place from which you came and from thence to a place of execution there to be hanged by the neck until you are dead. For all this sound and fury, one would hardly know that it was generally and publicly understood the sentence would be swiftly commuted — as it was, a few days later. Arthur Lynch received a free pardon in 1907, and in 1909 was returned to parliament as an Irish nationalist delegate to resume his remarkable career as writer, physician, engineer and all-around polymath. * Lynch’s part in the war is included in The Boer Fight for Freedom, another century-old tome in the public domain and available on Google Books.